An impressive detached home located down a private driveway within the heart of the picturesque village of Nocton. The property is situated on a stunning plot with open views to the rear and a driveway providing off road parking and giving access to a Detached Double Garage. Internally the property offers flexible and spacious living accommodation to briefly comprise of Entrance Hallway, Kitchen, Utility Room, Rear Entrance Lobby, Downstairs WC, Dining Area, Lounge, Master Suite with Dressing Area and En-Suite Shower Room, Bedroom 2 with En-Suite Shower Room and First Floor Landing leading to two further Bedrooms and Shower Room. Viewing of the property is essential to appreciate the accommodation on offer. LOCATION Nocton is a picturesque village located approximately 8 miles from the City of Lincoln. The village has its own primary school, located opposite the Church. The nearby villages of Potterhanworth, Dunston, Metheringham and Branston all offer a wide range of local amenities and secondary schooling. SERVICES All mains services available. Oil fired central heating. There is a pressurised water system and water softening unit. ENTRANCE HALL With double glazed external door to front elevation, oak staircase leading to the First Floor Landing, two radiators, coving to ceiling, built-in cupboard space, floor lighting and oak doors leading to the Kitchen, Lounge, Dining Area, Master Suite and Bedroom 2. KITCHEN 15′ 7" x 14′ 3" (4.75m x 4.34m) With dual aspect double glazed windows to front and side elevations, fitted with a range of wall, base units and drawers with granite and oak work surfaces over and complementary tiled splash-backs, sink unit and drainer with mixer tap and water filter system, integral combi oven/microwave, integral tilt and hide oven, induction hob with extractor fan over, integral dishwasher, space for a fridge freezer, radiator, coving to ceiling and oak doors leading to the Utility Room, Rear Entrance Lobby and Dining Area. UTILITY ROOM 11′ 0" x 8′ 5" (3.35m x 2.57m) With double glazed window to front elevation, fitted with a range of wall, base units and drawers with work surfaces over and tiled splash-backs, stainless steel sink unit and drainer with mixer tap, space and plumbing for washing machine, oil fired central heating boiler and hot water cylinder. REAR ENTRANCE LOBBY With uPVC double glazed external door to side elevation and door to the Downstairs WC. DOWNSTAIRS WC With low level WC, wash hand basin, fully tiled walls, heated towel rail, coving to ceiling and extractor fan. DINING AREA 12′ 2" x 10′ 9" (3.71m x 3.28m) With double glazed window to rear elevation, double glazed door to side elevation, coving to ceiling, radiator and opening to the Lounge. 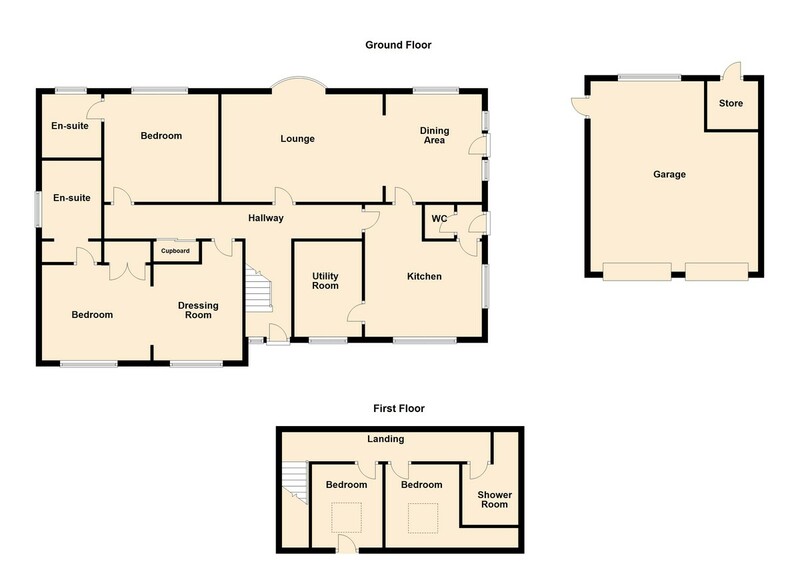 LOUNGE 18′ 0" x 12′ 1" (5.49m x 3.68m) With double glazed bay window to rear elevation, feature fireplace with multi-fuel burner inset, radiator, coving to ceiling and oak door leading to the Hallway. DRESSING AREA 14′ 7" x 10′ 8" (4.44m x 3.25m) With double glazed window to front elevation, radiator, coving to ceiling and opening to the Bedroom Area. BEDROOM AREA 12′ 2" x 10′ 5" (3.71m x 3.18m) With double glazed window to front elevation, radiator, coving to ceiling and oak door to the En-Suite Shower Room. EN SUITE SHOWER ROOM 8′ 7" x 6′ 2" (2.62m x 1.88m) With double glazed window to side elevation, suite to comprise of low level WC, wash hand basin with drawer below and walk-in shower cubicle, radiator, partly tiled walls and coving to ceiling. BEDROOM 2 12′ 9" x 12′ 1" (3.89m x 3.68m) With double glazed window to rear elevation, built-in wardrobe, radiator and coving to ceiling. EN SUITE SHOWER ROOM 6′ 8" x 6′ 3" (2.03m x 1.91m) With double glazed window to rear elevation, suite to comprise of low level WC, wash hand basin and walk-in shower cubicle, fully tiled walls, heated towel rail, radiator and coving to ceiling. FIRST FLOOR LANDING With Velux window, two radiators access to eaves storage and doors leading to two Bedrooms and Shower Room. BEDROOM 3 9′ 4" x 8′ 8" (2.84m x 2.64m) With Velux window, access to eaves storage and radiator. BEDROOM 4 8′ 7" x 8′ 1" (2.62m x 2.46m) With Velux window and radiator. SHOWER ROOM With double glazed window to side elevation, suite to comprise of low level WC, wash hand basin with tiled splash-backs and walk-in shower cubicle with tiled surround, radiator and extractor fan. OUTSIDE The property is located down a private driveway leading to the property’s driveway providing off road parking and giving access to the Detached Double Garage. There is a lawned garden to the front with attractive flowerbeds and gated access to the rear. To the rear there is a patio seating area with raised planters leading to well maintained and attractive gardens with a range of different areas incorporating seating areas, lawned gardens, water features, raised planters and rockery, all with open views to the rear. To the adjacent side of the property there are further lawned gardens. DETACHED DOUBLE GARAGE 21′ 2" x 18′ 8" (6.45m x 5.69m) With two electric roller doors, storage cupboards, power, lighting and door and window to the rear garden.